Civil Asset Forfeiture Reform designed to restore 5th amendment protections. The constitution laid out the responsibilities and roles of the different parts of the federal government. However to clarify its scope and the limits, it was necessary to enact the bill of rights. And over the years, as different administrations championed their own versions of judicial conduct, even THAT became corrupted in application. Business owners and citizens have had to fight the leviathan of big government simply to retrieve confiscated property that was either improperly taken, or destroyed by overly zealous authority, even without criminal charges being filed. 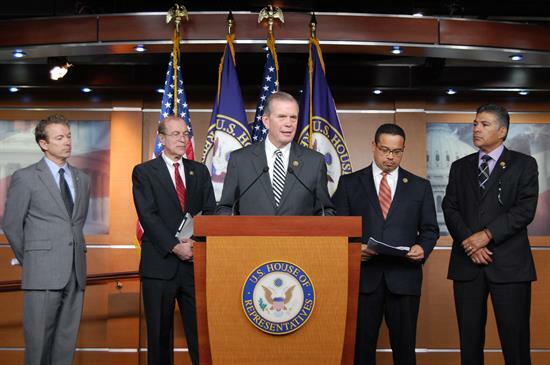 Rep. Tim Walberg (R-MI), Sen. Rand Paul (R-KY), Reps Tony Cardenas (D-CA), Keith Ellison (D-MN), and Scott Garrett (R-NJ) are hoping to correct this, and once again clarify the meaning of due process, and restore the value of the 5th amendment. The Fifth Amendment Integrity Restoration Act is apparently designed to do that. The FAIR Act has been endorsed by the Institute for Justice, the National Association of Criminal Defense Lawyers, and the ACLU showing the wide ideological spectrum that supports reform. Civil asset forfeiture reform is also supported by groups like the Heritage Foundation and the CATO Institute. We (or I do anyhow) encourage its passage as well. And then, look at a number of other ways in which the federal government has abused the bill of rights and start picking off those abuses one by one. We have documented a slew of 1st, 2nd, 4th,and certainly 5th amendment violations. We have also noted that the 9th and 10th absolutely have violations as the 14th amendment is cruelly misapplied. So we offer thanks for recognizing the abuses by the government, and hope that additional remedy is on the way. It should only be a start. Can you imagine this jagoff doing something like that? Ha! Please.